Where does one start? 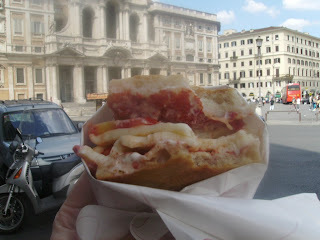 Italy just is a food experience, inherently and incessantly. This particular trip to Italy provided some slightly more upmarket experiences, rather than just astonishing pasta at €5 a bowl. The first of note was in fair Venezia, where I spent four extraordinary days around my brother’s wedding. On one such sunny day, just perfect for stepping out in glad rags with a swagger, I lunched with Peter and his friends at Hotel Bonvecchiati. And did we lunch! 5 hours of wine, food, rapport, witticisms, and did I mention wine? 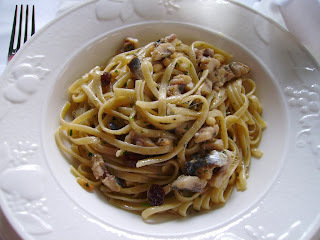 Main course featured some favourite flavours of mine - pine nuts and currants - mixed up in flat spaghetti with sardines. As you can see, it was generous, not least in the distribution of sardines. My naturopath has been at me to eat them, and there’s an unopened packet in my pantry waiting for the craving to hit…I enjoyed this dish, with its appropriately al dente pasta, and the almost Moroccan mix of nuts and currants, but I don’t think it’s going to help with my sardine intake. The fish flavour lingered for some time, and got in the way of the very fine Brachetto (a sweet, red, sparkling wine, now being grown by Pizzini in King Valley) we drank with dessert. Dessert…I could just show you the picture of the chocolate souffle really and that would tell you how fabulous dessert was. It was so rich on the inside, with a moussey, cakey outer layer. 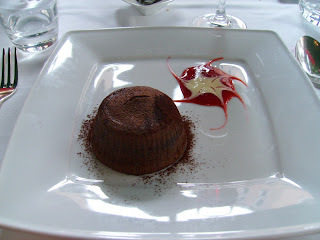 The raspberry sauce was just bitter enough to cut through the sweet chocolate, and the decadence of a spoonful of cream on top of all that chocolate was a perfect end to an lunch of indulgence. The day’s food experience wasn’t quite over as that night we had drinks and canapes at Allegra’s mother’s house. There I discovered the deliciousness of pickled pumpkin with parmesan, the pumpkin combining its softness and sweetness with the nuttiness and grit of the parmesan. 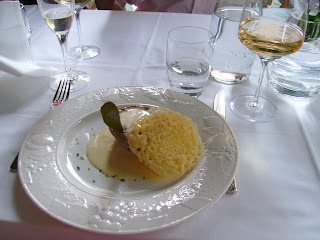 It went wonderfully with the Friuli wine, which I was to discover at the wedding reception, in the form of 2005 Ribolla Gialla, is a truly complex and complete white wine. 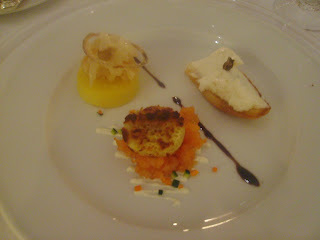 The food at the wedding reception was extraordinary. We started with tris di antipasti del Monaco - the local speciality of beaten cod, salmon topped with an egg pattie, and a disc of polenta topped with prawns. And we went up from there. 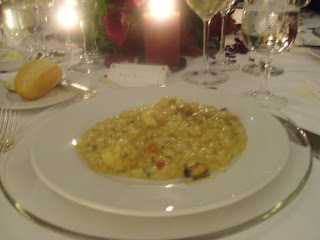 The starter was risotto di pesce alla Veneziana. It's an interesting choice to serve shellfish to a group of 50, but I was not complaining! The only downer was when the waiters came around with serving platters full of the rich, moist, cheesy risotto, offering seconds; but knowing there was still meat and dessert to come I had to decline. 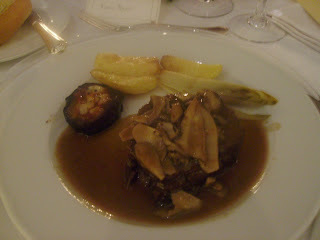 The main was a triumph: filetto di manzo con funghi porcini. How the chefs could prepare meat that well - thick cut, seared dark brown on the outside and perfectly pink - in that quantity I don’t know. My favourite taste experience of the whole night was the round of eggplant filled with tomato and mozzarella accompanying the meat. Dessert was sorbetto all uva fragola, but unfortunately my senses were overwhelmed by this point and there is neither photographic nor oral-sensory record. What else was fab in Italy? 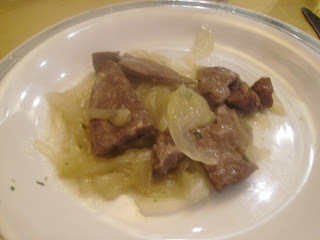 Well, this fegato (liver) wasn’t, part of an uninspring Menu di Touristico. It tasted like, well, offal, without any of the subtleties of spice and accompaniments that normally make that a good thing. 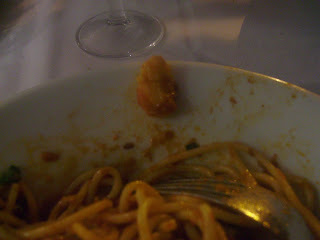 A dish that was in no way subtle was a spaghetti all’ amatriciana in Roma. I was in dire need of treatment for a cold, and my preferred method thereof is as much chilli and garlic as possible. The dish needed the addition of chilli flakes to fill the first ingredient requirement, but there was no such trouble with the garlic. The dish was laced with whole cloves, which I ate the same way. This pizza was as surprising and flavoursome as the fegato had been disappointing and dull. My last food in Italy, it was bought by weight at a pizzeria on Merulana. Nothing more than dough, basil, mozzarella and tomato, popped in an oven for a few minutes, then cut and folded like a sandwich. And it was superb, a taste to last like the greatest of Rome’s structure, such as Santa Maggiore which it foregrounds in the photo.